Illinois Holocaust Museum & Education Center will bring a pivotal era of rock music history to life with its new exhibition, Bill Graham and the Rock & Roll Revolution, opening July 16, 2017. This exhibition explores the extraordinary life of renowned music promoter Bill Graham (1931-1991) who helped launch and promote the careers of countless artists including the Grateful Dead, Jimi Hendrix, Santana, Jefferson Airplane, Janis Joplin, The Who, Led Zeppelin, and the Rolling Stones. It also traces the indomitable spirit of a man brought to the U.S. as an eleven-year-old Jewish refugee fleeing the Nazis, fueling a lifelong passion and advocacy for social justice. Graham’s celebrated Fillmore Auditorium in San Francisco was the epicenter of rock’s evolution in the 1960s. Graham went on to promote social change as a driving force behind milestone benefit concerts such as Live Aid (1985) and Human Rights Now! (1988). Bill Graham and the Rock & Roll Revolution transports visitors to that era with an abundance of memorabilia, archival concert footage, historical and new video interviews, and psychedelic art, demonstrating the lasting influence of Graham’s vision on the immersive, multidimensional, and highly lucrative phenomenon of rock theater that persists today. – Unique to the Illinois Holocaust Museum exhibition are a trio of rare memorabilia courtesy of the Jerry Garcia family: lyrics to “He’s gone” with Garcia’s handwritten edits; a set list; and his Mark I combo amp & speaker. – Memorabilia from the Fillmore Auditorium, including the original apple barrel that greeted fans with fresh apples at the entrance. – Two of the Grateful Dead New Year’s Eve concert costumes worn by Bill Graham. – Iconic photographs from rock’s most famous photographers. – Costumes, musical instruments, and artifacts from the careers of Janis Joplin, Keith Richards, Pete Townshend, and other groundbreaking artists. – An installation of “The Joshua Light Show”—the liquid light show conceived in 1967 by multimedia artist Joshua White — customized specifically for the exhibition. – Preparatory drawings and the original artwork of several iconic Fillmore concert posters, revealing the signature visual styles and creative process of psychedelic poster artists Bonnie MacLean, Wes Wilson, David Singer, Greg Irons, and David Byrd. Bill Graham and the Rock & Roll Revolution also illuminates how Graham’s childhood experiences as a young refugee from Nazi Germany fueled his drive and ingenuity as a cultural innovator and advocate for social justice. Born in Berlin, Graham arrived in New York at the age of eleven as part of a Red Cross effort to help Jewish children fleeing the Nazis. The exhibition follows his path from a foster family in the Bronx, to military service in the Korean War, to his arrival in San Francisco just as the hippie movement was gathering steam. Throughout his career, Graham’s mastery at promoting, marketing, and managing artists propelled him to become one of the music industry’s most important figures. 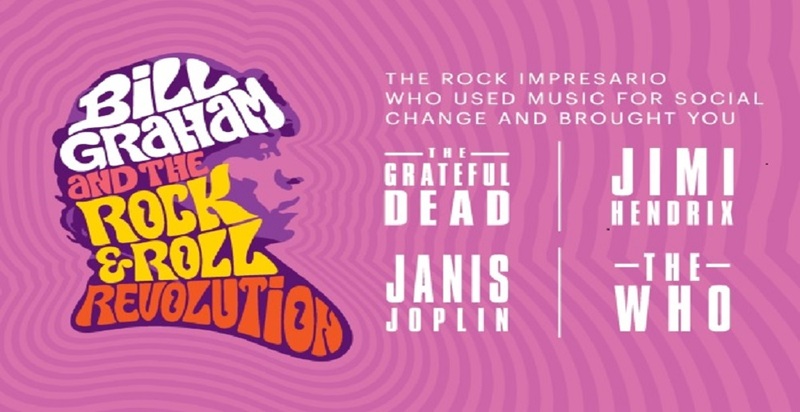 Bill Graham and the Rock & Roll Revolution runs from July 16 to November 12, 2017 at the Illinois Holocaust Museum & Education Center, 9603 Woods Drive in Skokie. For more information about the exhibition and related programs, visit www.ilholocaustmuseum.org. PreviousPrevious post:Dark Days: Chicago gallery exhibit explores WWII Japanese internment camps in U.S.
NextNext post:LUZIA by Cirque du Soleil is a hit!